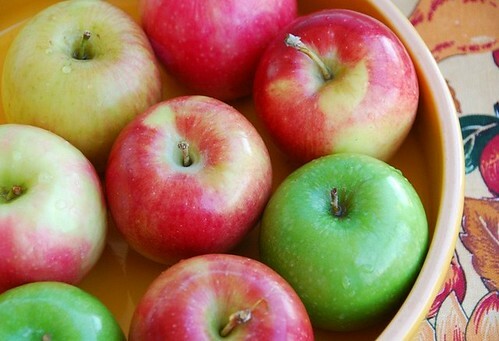 Food Blogga: What Are the Best Apples for Baking? There are nearly 100 apple varieties sold commercially in the U.S. How do you choose the best ones for baking? The key is to consider both flavor and texture. The apples you choose should be firm so they'll maintain their shape and not turn to sauce when cooked, and they should be slightly tart since you’ll sweeten them up with sugar and spices. People have regional preferences for apple varieties such as MacIntosh in New England and Fuji in Washington. When possible choose fresh, locally grown apples, which will be more flavorful and allow you to brag -- “I baked this pie with apples I picked this morning!” Also, many bakers agree that the tastiest apple pies come from mixing sweet and tart apples. Best for pies: Sturdy, thick-skinned apples with a sweet-tart flesh. Braeburn, Granny Smith, Gravenstein, Jonagold, Jonathans, Pink Lady, Pippin, and Winesap. Best for baked goods such as muffins, scones, and cakes: Firm apples with a sweet-tart flesh. Fuji, Gala, Empire, Golden Delicious, Honeycrisp, and Rome Beauty. Best for applesauce: Softer, sweeter apples. Ambrosia, Cameo, Cortland, MacIntosh, and Macoun. What are your favorite apples for baking? A good apple for baking here in BC is Jonga Gold. Ebery area would have their special apples that you can't seem to find elsewhere. My favorite ? Simply "Warmed Spiced Apples and Maple Syrup". Delicious ! This is such a helpful guide! I've bookmarked it so I can reference it whenever I need! Braeburns are my go-to apple, and my favorite dessert is apple crisp. Thanks for this, Susan. I am about to tackle an apple cake and this was incredibly helpful! I like northern spy apples! val-We get Jona Golds sometimes too. They are really good for baking. chelsea-Oh, good. I'm so happy to hear it! kevin-I like Braeburns as an eating apple too. And who doesn't love apple crisp? What a great guide... thanks for sharing! I love this post. This is going to be very handy info as I head into fall and start all my holiday baking!! I make these yummy apple "pop tarts" and generally use a little sweet and a little tart! However, when I just want to eat an apple, it is always a fuji! I love, love, LOVE Granny Smith apples for baking and Jona Golds and Braeburns. Living in Michigan we have many varieties of apples available, but Spy or Northern Spy are my favorite pie apples.